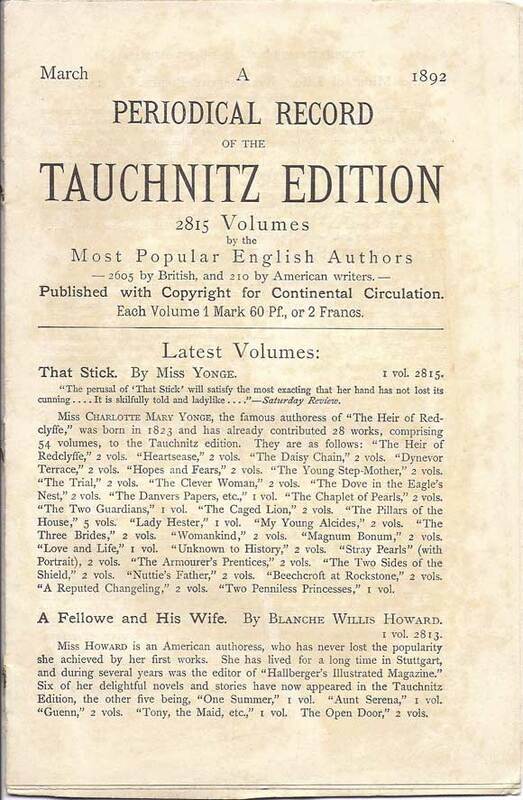 I have always been interested in the various brochures, bookmarks, leaflets and catalogues that Tauchnitz used to advertise their wares. As well as providing a wealth of background information on the firm, they add variety and interest to a collection. So far as I can judge from the Todd & Bowden research on other collections, my own collection is richer in this type of material than any of the other major collections. I have copies of many of the Monthly Descriptive lists, and of the general catalogues and other special lists, and there are photos of a selection of these in the Photos section of the website. As with the books though, my guide to what I’m looking for has been the Todd & Bowden bibliography, which in sections L8 and L9 gives a detailed record of the various types of advertising that exist. Comparison with this guide reveals that after well over 20 years of collecting, there is still one significant gap in my collection. 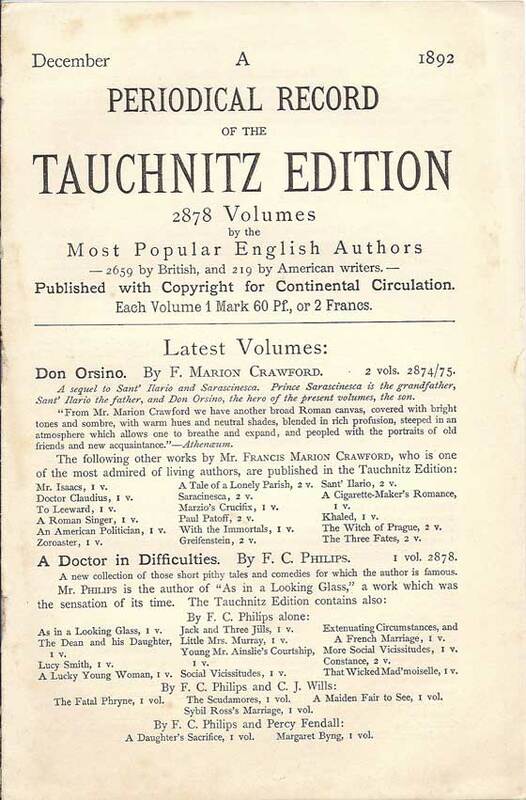 I have never found a copy of the Tauchnitz Quarterly Record issued in 1876 and 1877. Todd & Bowden (in section L8b) record at least 5 quarterly issues, although they too were unable to find any surviving copies, either for their own collection, or in any of the other collections that they inspected. 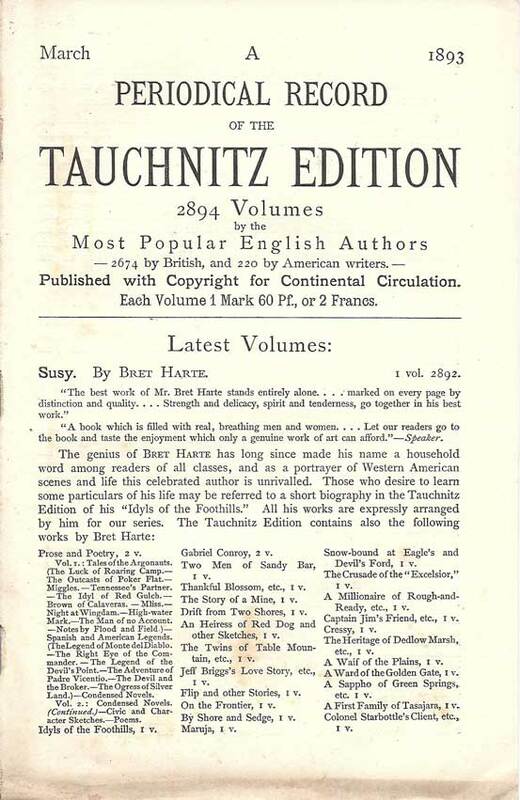 I have recently though come across 3 examples of an apparently similar ‘Periodical Record of the Tauchnitz Edition’ dating from 1892/3. Could these be a direct successor of the Quarterly Record? Although coming 15 years later, they appear to fit the description applied to the Quarterly Record, and they are dated in March and December 1892 and March 1893, so seem to fit a possible quarterly schedule. Did the firm perhaps continue to issue similar lists on an intermittent basis for many years while failing to issue them quite regularly enough to justify the title of a quarterly record? One clue to explain why so few of these catalogues have survived is their size. At roughly 22 x 14cm they are considerably larger than most Tauchnitz catalogues and lists, and in particular are too large to be kept within the pages of the books themselves. Most of the other lists and leaflets that have survived, have done so comfortably pressed between pages. Larger leaflets like these have had to make it through the last 100 years or more on their own.